There is nothing more special than a man and a woman’s special wedding day. When that day comes, everything must be perfect. From the walk down the aisle, right to the slicing of the wedding cake, couples strive to make sure that each part of their wedding could be considered as magical. Of course, outfits play a significant role on that special day as well. It is a given that the bride and groom should look stunning on their special day but what about the other people in attendance? The bridesmaids and the groomsmen often match what their counterparts are wearing so what they look like should be pretty easy to determine. What most people tend to overlook though is the fact that the father of the bride and groom to be should be dashing as well. Most fathers aren’t too focused on what they’ll wear on that special day and that is why it is everyone else’s job to make sure they look that part once he walks his daughter down the aisle. Here are some outfit ideas for the father of the bride and groom. 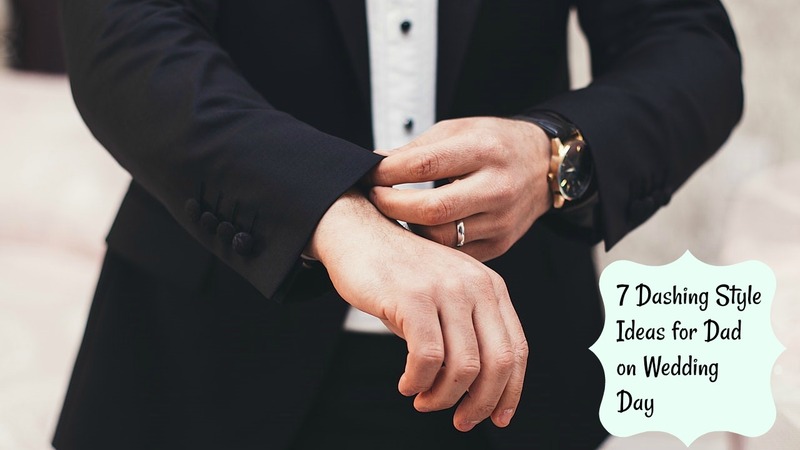 While suits and tuxedos are a norm at weddings, the times have changed drastically and the proper outfit for that special day is significantly different as well. Instead of wearing the traditional suit and tie outfit, the father of the bride and groom could opt to wear a vest and a bowtie. This simple yet fashionable style is fairly common in various events nowadays and it could be pulled off during a wedding as well. It is certainly the best way to pull-off that hipster look for dad. Perhaps the most popular style for a father of either the groom or the bride is being clad-in-black from head-to-toe. It is a timeless classic that will make any man 100% more charming and it finds its place during weddings as well. It is simple, achievable, and most importantly easy to pull off. The standard all-black ensemble features a black tuxedo partnered with black leather shoes, black pants, and a black belt. That could suffice but having to wear black accessories such as black watchers or a black tie is a welcome addition as well. Alternatively, the father could also opt to wear a different colored suit aside from the usual black outfit. Some of the popular colors for suits include beige, dark blue, and even light blue. There are a ton of viable options to choose from. If there is a central theme to the wedding, then it would be best to ensure that dad’s outfit perfectly matches that motif. One of the key issues with dads during wedding days is that they often wear baggy clothes or items that are a few sizes above them. This is a big NO-NO. It is always important to know their body type before buying anything. The best workaround to the issue is by sizing them up and finding them body fit clothes. Body fit clothing makes anyone look more masculine regardless of age so the same could be said for dad. It is also not proper to make them wear clothing that is too tight. What’s important is that the fit must complement the father’s body, so he is able to look at his best while feeling comfortable at all times. Sometimes, making the father stand out during the wedding isn’t always the best option. If that is the case, then it would be great to have the father’s outfit perfectly match with what his wife is wearing. Alternatively, his outfit could also match the outfit of his son or daughter. This would make photos even more appealing as there would be synergy between the outfits of the family members. Let’s face it, the most dashing men in the world are those that walk on the red carpet. Brad Pitt, George Clooney, Ben Affleck; these are just some of the guys a father could find inspiration from during his daughter or son’s special day. The outfits that these guys were during award shows are not patented so copying is always permitted. Copying their clothes from top-to-bottom is not advisable though as what they wear are probably way too expensive. Instead, the father should wear clothes that look similar to what these Hollywood stars wear on the red carpet. If there are people to find fashion inspiration from, it’s definitely from the top actors. If you the bride and groom really have no idea what the father should look like, then the best option would be to hire the opinion and hand of a professional designer. There are countless designers out there that go through this woe on a daily basis and they are always open to helping out the husband and wife to be. Companies like LuvBridal not only provides the clothes that the bride and groom needs, they also provide the outfit of the bridesmaids, groomsmen, and most importantly, the fathers of the lovely couple. Since designing an outfit on our own is challenging work, this company opts to let the professional designers to their work without any major restrictions. When it comes to finding out which outfit matches who, no one does the job better than professional designers. In fact, getting their help from the get-go is even advised as they can create a central theme of the outfits in the wedding. While designer outfits for dad is always a good option, turning to them for help initially is a sound idea as well. There are countless styles and outfits to choose from. It all really boils down to what makes the father truly dashing on the special day. While the style guide above can be useful, others are always free to give their own take on their father’s outfit. But of course, they must never forget that the father must feel comfortable when wearing his outfit as well.